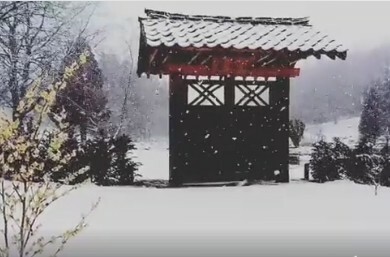 JAPANESE WELCOME GATE: A reconstruction of a gateway to the Japanese garden at Cowden Castle near Dollar. 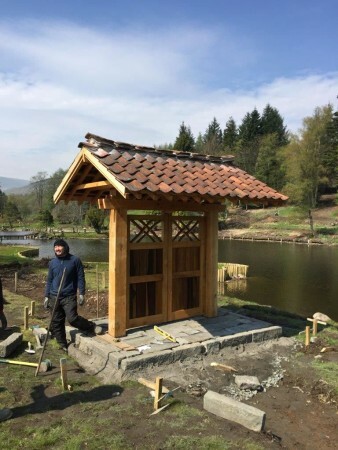 This gateway is constructed in a Japanese style, but with a mixture of traditional Japanese and Scottish elements. For example the tiles are reclaimed traditional Scottish pan-tiles which seemed perfect for the job as there is a form of tiles commonly used in Japan which resembles them quite closely, at least in general form. The design decisions were informed by historical precedent (very fuzzy indistinct photographs and some actual part rotted remains), traditional Japanese practice, materials durability issues, and an initial remit from the client to include some Scottish elements (pan-tiles, saltire inspired panels in doors). We built the entire thing (bar the stonework at the base which was done by Junya Matsukawa) and raised it by hand. All the european larch used in the roof was sourced from within the Cowden estate, not a quarter of a mile away in fact, and milled on site by Keith Threadgall. The saltire decoration forming the tops of the doors is made of laburnum split into laths. The timber was from Scottish Wood (oak), Cowden estate (larch).